Blue Samui is a hidden treasure: a 3-bedroomed hillside property built on three levels, backed by tropical greenery and with spectacular views from its terraces and infinity pool. Stylish interiors and comfortable outdoor spaces create a relaxing family retreat with easy access to the island's main beaches and attractions. Finding Blue Samui isn't easy and that's part of the appeal. Even though the villa is just ten minutes from Samui's main port town at Nathon, it’s hidden away up a winding lane that emerges onto a forested hillside fronted by breathtaking seascapes. 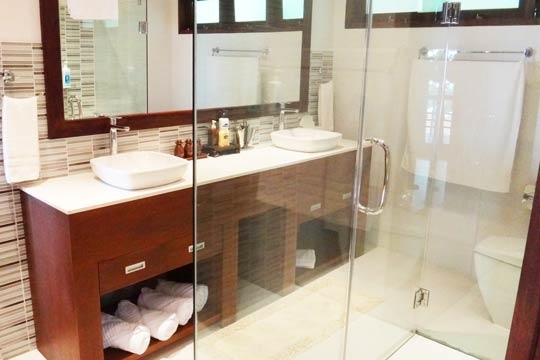 Although one of the first luxury villas to be built on Samui, recent upgrades like new roofing, fresh decor and attractive modern furnishings mean you never lack for comfort. Appealing additions such as the sink-into planters' chairs on the bedroom terraces provide the perfect spot to relax and read; the cool combination of natural materials and white walls creates an overall sense of space and light while contemporary artwork adds a touch of style. Daily activities generally revolve around the pool, the sala (gazebo) and the lounge. The former quite small at just eight metres, but perfectly positioned for a dreamy dip and for catching the refreshing sea breeze, with the water pouring straight into the spectacular scenery. If you can live without the beach on your doorstep, Blue Samui has everything else you’ll need. Start with a late breakfast and then laze by the pool – switching between the sun loungers and the shaded sala – before moving inside for dinner and a movie in the evening and retiring to the air conditioned comfort of your bedroom. 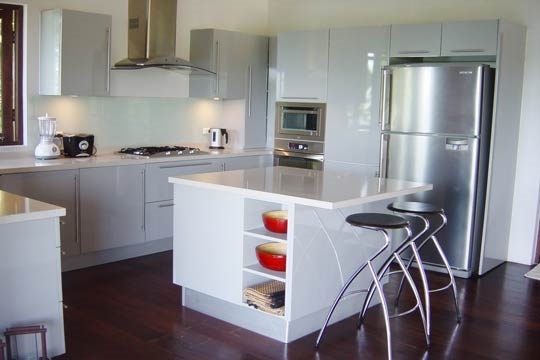 The kitchen has every appliance and accessory needed to create your own gastronomic delights and there's also a barbecue at your disposal for alfresco feasts. The villa comes with two friendly and committed live-in staff who keep things very clean and ordered, as well as helping out in the kitchen (although they are not trained chefs – the villa is self-catered) Fine, serving drinks and nipping out for supplies. 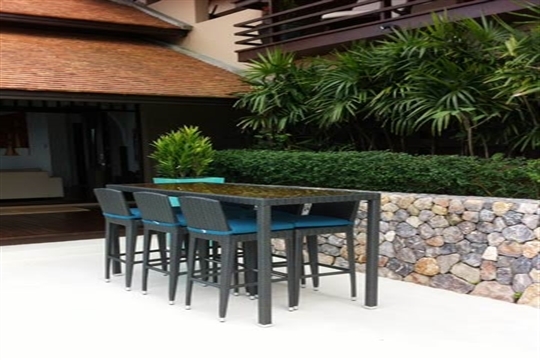 With a car you are only minutes from some pleasant beachside eateries, while the popular beaches of Bo Phut and Chaweng also offer a good choice of dining, shopping and entertainment options. 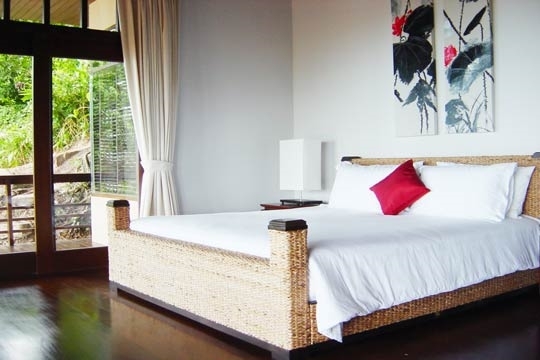 Although Blue Samui may not be ideally suited to toddlers or seniors due to its elevated position and proliferation of steps, the two adjoining guest bedrooms make it a comfortable family villa for those with older kids (10+). Avoid the crowds with views that rival the island's best. The superlative views from almost every point on the property not only cement the sense of escape but also give the villa an added sense of space and beauty. 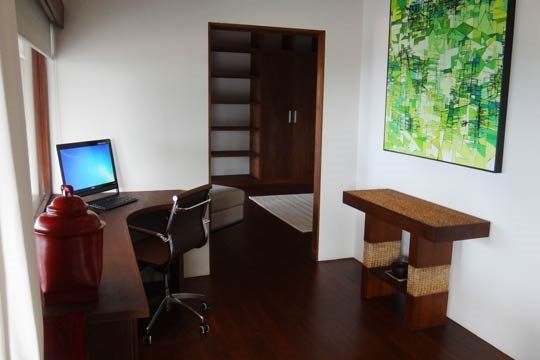 The secluded hillside setting also guarantees absolute privacy, making this an ideal getaway for those looking to remove themselves from the stresses of city life. Proximity to nature means sharing space with insects, falling fruit and the occasional surprise guest (bats fly around at sunset during certain seasons). But the villa has been designed to minimise natural intrusions with covered terraces and glassed off garden areas. The only human intrusion is a little traffic noise from the ring road that passes below the villa, but the views more than compensate. 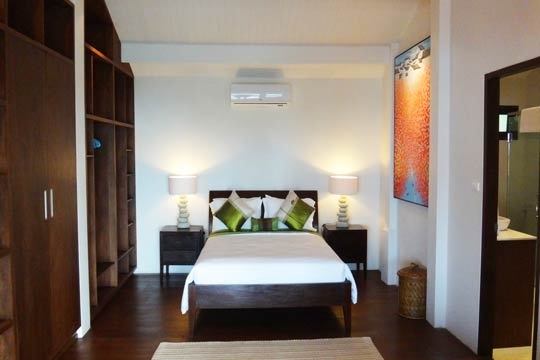 If you are looking for a place to relax, Blue Samui is definitely something for you! The villa gives you everything you need to forget hard days at work and makes a dream come true. If you are someone who is looking for pure relaxation, Blue Villa is the best place were you can enjoy great view, cool drinks in the sala or just have a good swimm in the pool. My wife and I had 19 great days at the villa! It is a place you could hang out for a while. Large living room, well equipped kitchen and a big sala makes living very easy. The bedrooms are huge, with a big bed in the master bedroom, where you will find a good sleep as its so quiet. And the great thing about the bedrooms are, you wake up in the morning and you have a stunning view over to Koh Pangan... makes you want to stay in bed for the whole day! Nathon Beach or Mea Nam are close by, even though we suggest you rent a bike or a car, because it is a bit far away from Chaweng Beach (40 min.) or Lamai (30 min.). There are lots of Thai Restaurants nearby, which serve great original Thai food for great prices. The housekeepers, Nu und Jo, take such good care of the villa and of you too, while you are there. They are so friendly and did such a great job and they have found a very special place in our hearts. We wish them all the best for the coming future. Two dogs, Pooky and Toto guard the Villa as well, such cute and friendly dogs, you will love them the first time you see them. All in all, it is a place we will get back to for sure. Marc the owner did a great job renovating the place, it has everything you need if you are looking for heaven on earth. 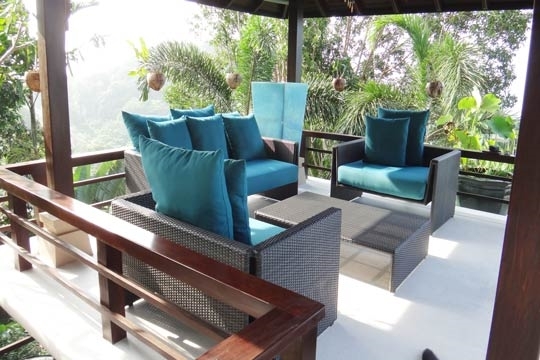 A secluded hillside location gives Blue Samui a very private feel. The bay directly below Blue Samui is known as Kao Laem Noi: a small, quiet beach at the northernmost tip of the Samui coast. It is sandy but with very shallow water, especially during the low summer tides from March to July when you can walk out for up to 100m and explore the rock pools. There are a number of traditional Thai-style roadside restaurants at the back of Kao Laem Noi. The luxurious Four Seasons Resort occupies a hidden cove around ten minutes drive from the villa, up the hill to the left, while to the right, at the end of the beach, a rocky headland reaches out towards the neighbouring island of Koh Phangan. This provides excellent photo opportunities, especially when the local fishing boats head out in the evening light. The modest, beachside village of Bang Por is little more than a loose collection of local seafood restaurants, minimarkets (handy for basic provisioning) and low key resorts, the latter offering varied but simple dining options. The area is also home to several established spa and wellness centres. The main island ring road runs quite close to the beach in Bang Por, which is very narrow with shallow waters but pleasant views across to neighbouring islands. A steep hill rises north from Bang Por, the road bending west at its crown before dropping towards Nathon, the island's main port and commercial district. Nathon is also a good place to buy simple souvenirs and to experience a little authentic local culture. There's a fresh market and moderately sized Tesco Lotus supermarket in town for more comprehensive provisions. The recently renovated villa is built over three levels and reached via steps from its two-vehicle car port. The lower level features a spacious, open-plan living and dining area with ensuite bathroom. A recessed space houses a wall-mounted flat-screen TV with DVD and surround-sound in front of two comfortable sofas (there's also an iPod dock and a notebook computer with WiFi for guests' use). The eight-seater dining table sits on a rug in the centre of the room and is served by a modern, well-equipped kitchen with an oven, hob, fridge-freezer and dishwasher. Outside, a covered verandah maximises the views while beyond that a spacious sun terrace and pool patio with cushioned loungers surrounds the infinity pool, which is modestly sized but perfectly positioned. A comfortable, furnished sala is poised for shaded relaxation between dips. Stairs climb through the centre of the property separating the villa’s two pavilions. 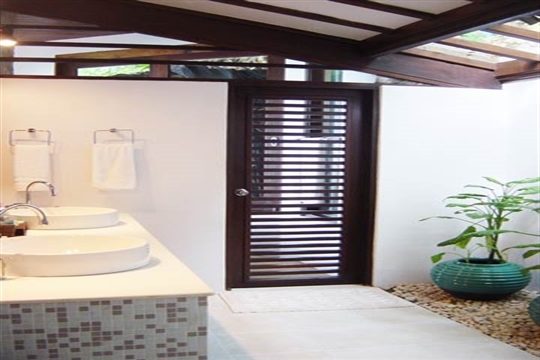 On the second level, overlooking the pool area, one of the pavilions houses two guest bedrooms (one queen, one twin) connected via a shared bathroom with rain shower, perfect for a family. 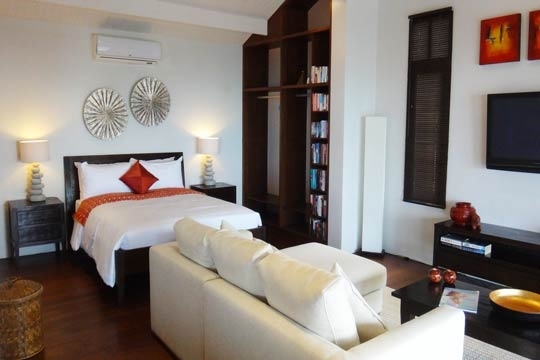 Both bedrooms are pleasantly furnished and accessorised with polished wooden floors and built-in wardrobes (there are no TVs in the bedrooms), and each slides open onto a covered verandah with a soft sofa and comfortable planters’ chairs facing the dramatic views. 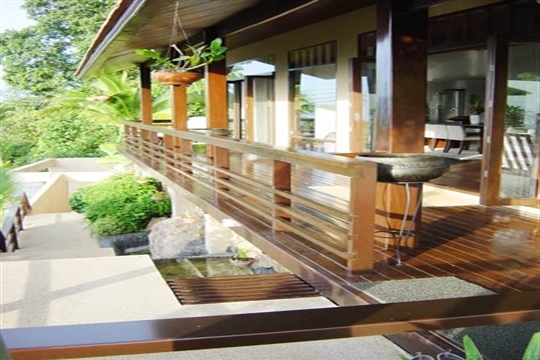 A second verandah runs behind these two bedrooms, shaded by the lush, cliff-side vegetation. The third level sits above the living area and houses the master bedroom, with unobstructed views right from its king size bed. 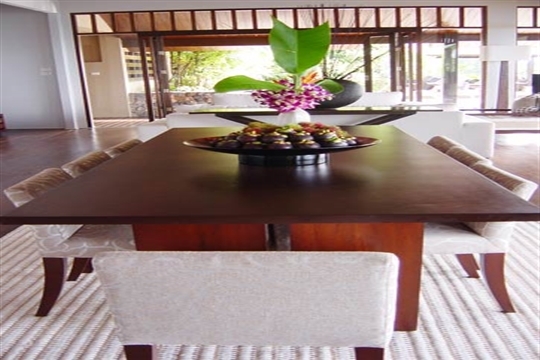 The room opens onto a wrap-around verandah and is simply but tasteful furnished with an emphasis on space. 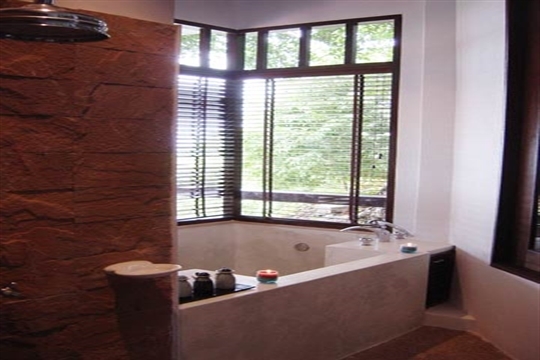 The attached bathroom is literally built into the cliff side and includes a rain shower plus a separate room with a glazed rear wall revealing the roots of an ancient Banyan tree, and boasting a generous bath tub with stunning ocean views, ideal for a romantic soak. The villa holds a commanding position on the hillside and although it opens right into the views from every room, none are overlooked. 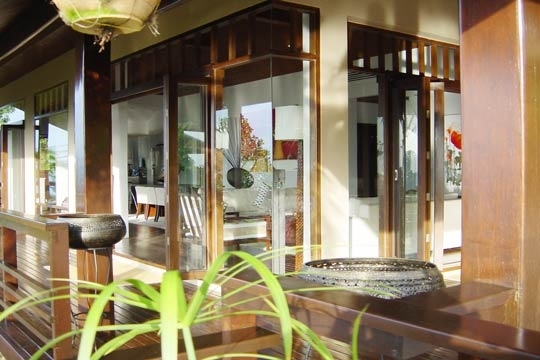 Folding doors allow you to close off the outside world when needed and there's concealed air conditioning throughout. Above prices are subject to change. For approximate rates, please click on the Check Availability button and enter your dates. Upon arrival at the villa you may be required to pay a security deposit. The security deposit, if applicable, will be returned to you prior to departure less any extra charges or costs for accidental damage to the property. 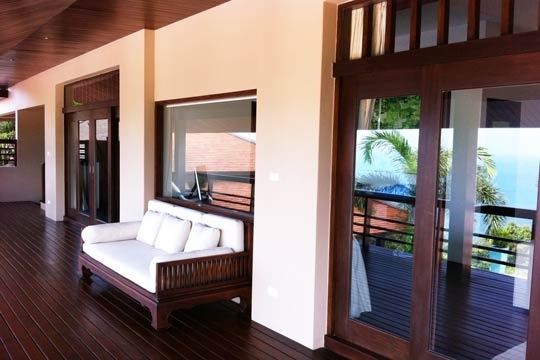 3 bedroom villa located in Bang Por-Nathon, Koh Samui. Ideal for Beach in ten, Body and soul, Bring the relatives, Going for golf, Fair share for groups, The great outdoors, Romantic retreats, Room with a view.